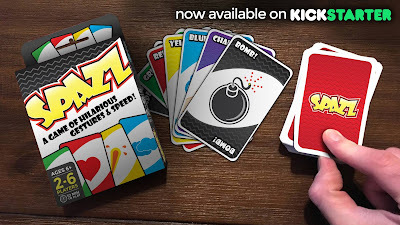 Home / Kickstarter Games / Kickstarter Spotlight - Spazz, the Card Game! Kickstarter Spotlight - Spazz, the Card Game! Have you ever noticed that some of the newer games are forgetting that some of the biggest gamers are kids? They may pout more than adults when they lose (well, everyone except Uncle Larry), but there is nothing like playing with them. 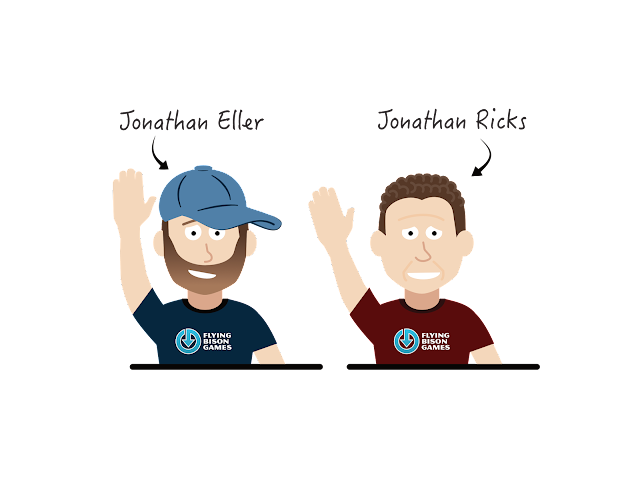 We (Jonathan Eller and Jonathan Ricks) decided to found Flying Bison Games to make sure that there continue to be great, fresh games made available that are appropriate for all audiences. And it turns out that games that are great to play with kids are great to play with adults, too. The first game in our upcoming lineup is Spazz. Spazz is a fast-paced card game that is living proof that your hands are not always connected to your brain. Looking ridiculous was never so much fun. Play is simple: the deck is dealt out and players keep their hand face-down in one hand. Players take turns flipping a card face-up into a pile in the center. Unless a special action card is played (we'll get back to that) play continues until the top two cards on the deck are a match. Once you have a match, players must perform the correct action as quickly as possible. The last person to do the action correctly (making mistakes in-between doesn't matter) has to take the pile. The first player to get rid of their cards wins. 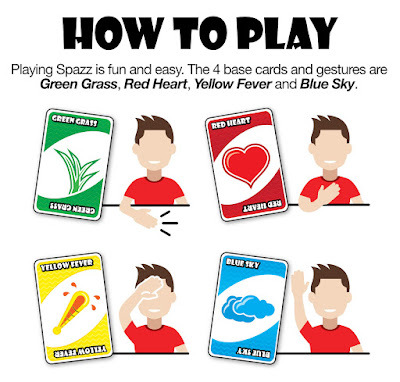 The four basic cards are green grass, red heart, yellow fever, and blue sky. This simple task is harder than you think when everyone is trying to do it as well. And at the same time, it is simple enough that even little kids can learn the basics (depending on the kid, 6 year-olds can play very well). The simple basics of the game get a little more interesting once you add in the special action cards. The special actions do various things, like making the next card played count as a match (the Next Up? card). 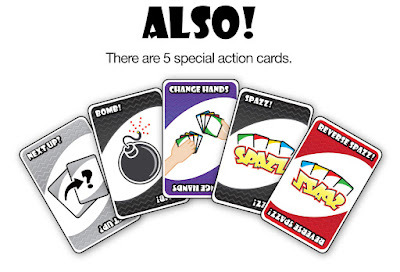 Or it makes players perform all four actions in the appropriate sequence (the Spazz card). Spazz is live now on Kickstarter, check it out by clicking HERE or the image below. As a heartfelt wish to you, your gaming group, family and friends, we hope you have as much fun as we do playing Spazz. And to make sure kids have fun playing, we are going to donate one copy of the game for every 100 Kickstarter backers to Make a Wish.